The vintage design revolution is upon us! And it’s influencing everything from fashion to art to architectural design. With pop-goes-vintage music groups like Postmodern Jukebox and historical dramas like Downton Abbey engaging audiences worldwide, the Roaring 20s are making a big comeback. Of course, Art Deco is following suit. Art Deco is a style of visual arts, architecture and design that developed into an international design movement in the 1920s and 30s. Let’s take a look at its trajectory through history, the echoes of which still resound today. Before Art Deco, the leading decorative style around the world was Art Nouveau. Developed in the 1890s, Art Nouveau is characterized by soft curves and a flowery, ornate style that imitates the beauty of nature—a stark contrast to the harsh industrialization of the day. Illustrations like Alphonse Mucha’s (below) often feature beautiful young women, flowering haloes and neoclassical robes that came to typify the Art Nouveau style. Art Nouveau lasted until the turn of the early 20th century, when World War I helped accelerate an increasingly industrial and progressive Western society. With the onset of war and rise of industrialization came modern art movements: Cubism, characterized by works like Pablo Picasso’s Les Demoiselles D Avignon and architecture like Raymond Duchamp-Villon’s La Masion Cubiste; Futurism, as portrayed in paintings like Giacomo Balla’s Abstract Speed + Sound and Umberto Boccioni’s The City Rises; and Constructivist art, which depicted the bold wording and stark geometry of Bolshevik Revolutionary war propaganda. These movements coalesced to form a new international style known as Art Deco, derived from Art Décoratifs, an abbreviated form of the 1925 World’s Fair in Paris, the Exposition Internationale des Arts Décoratifs et Industriels Modernes. Art Deco’s bold lines, geometric shapes and modern aesthetic represented luxury, glamour and technological prowess during the wartime and post-wartime era. Art Deco manifested in graphic design with images of industry, like colossal ocean liners with sleek, airbrushed surfaces that emulate steel and chrome plating. The style is represented in architectural icons like the Chrysler Building and the American Radiator building. They are constructed with an exterior of reinforced concrete and an interior of highly polished marble, glass and steel. After WWI, advertisement posters also shifted from flowing, floral illustration to streamlined, geometric graphic design. Strong diagonals and dynamic typefaces demonstrated the desire for glamour, power, luxury and strength. More than just a style, the Art Deco aesthetic reflects the major cultural shifts happening between the 1920s to 40s, when metalworking machinery and freight locomotives started changing the world. This era, known as the Machine Age, was characterized by mass production, automobile assembly lines, high speed printing presses, the nationwide distribution of goods and modern aircrafts & battleships. Likewise, in Art Deco, shapes became simplified and streamlined. Strong vertical lines and aerodynamic forms mirrored skyscraper steel beams. Airbrushing effects and sunbursts evoked wartime machinery. Sleek and angular typefaces reflected a Jazz Age gleam. Take, for example, A.M. Cassandre, the father of Machine Age poster style. He popularized airbrushing techniques that give a machine-like surface to his images and revolutionized design for years to come. 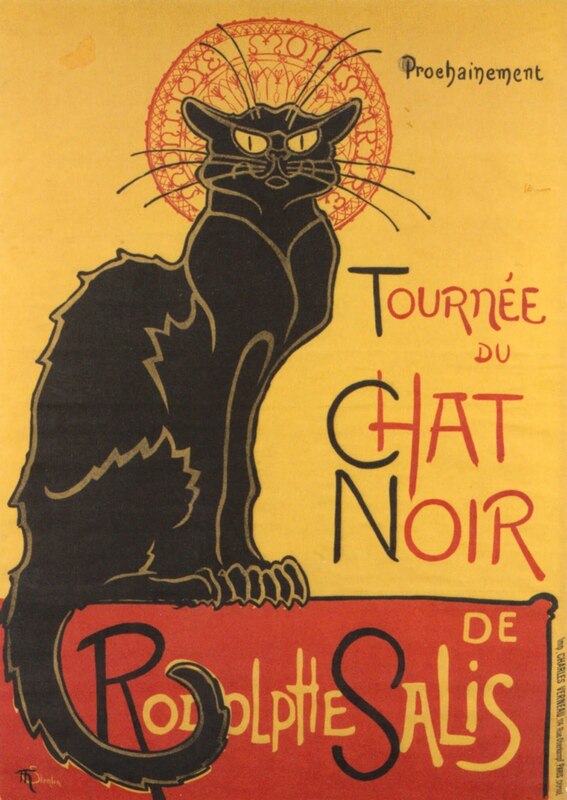 In fact, his iconic Art Deco posters are highly sought after, even today. Art Deco has come to represent cosmopolitanism and the ultramodern, and Art Deco advertisements, in particular, present products and services in a striking, futurist light. The style’s influence also spread internationally, and in Japan, came to typify Western influence and the boldness of the modern era. Art Deco paved the way for post-World War II 1950s Object Poster Style, in which everyday objects became giant icons used to emphasize advertised products. Characteristic of Object Poster Style advertisements, Peter Birkhauser’s “Feba Pen” poster puts a dramatic zoom on the tip of a fountain pen with severe clarity, captivating focus and bold effect. In the subsequent decades, advertising styles that emphasized consumer goods faded, particularly during the 1960s counterculture movement, which harkened back to Art Nouveau’s penchant for free form. Now a century later, Art Deco has made a comeback in graphic design. We can see the contemporary use of Art Deco style advertising in companies like Speakeasy Brewing Co., in movies like Baz Luhrmann’s The Great Gatsby, in TV shows like “Boardwalk Empire,” in typefaces like Chicago, Showtime, and Bifur, and in logos created by the global design community of 99designs. In the case of Art Deco, vintage and modern expertly coalesce to create a bold, classic look. Consider the Art Deco’s aesthetic to convey sleek and chic style, and play on our fascination with classic design that has a contemporary, futuristic flair. Looking for more Art Deco advert inspiration? Check out 99designs Discover for more stunning examples from our global design community.